Hi guys, As most of you know we have been working on making some changes to VVA’s beach program. The reason is to keep the VVA program viable for the program’s coaches. Under the current structure annual members of VVA don’t pay anything to the coaches running the sessions. In order for VVA to retain its coaches and continue implementing the style of beach volleyball we have developed we will no longer be able to offer an annual membership fee option. This will come into effect once National Tour ends at the start of March 2014. Players must register in advance for group sessions so that we can work out coaching requirements. To register head to http://vvabeach.signupsheet.com A waiting list will be made available should it be required. In addition to the group sessions, we are implementing private session time slots for those of you dedicated to reaching the highest levels of the game. Private training will be available from Haydn Ellis, Sange Carter and Damien Schumann. Check out the link attached to the VVA Beach Calendar. If demand for group sessions is high then a second group training may be added. Finally, we will be running training camp style weekends on a regular basis. This will allow us to invite athletes from interstate to join us in a full weekend of training. Haydn will run both days and players will be able to train at 2 sessions per day on both Saturday and Sunday. Each session will be 3 hours in duration. Training camps will vary depending on demand and may be specific to a particular group of players (e.g. elite women). See below for the new details regarding weekend training times. Cost: $30 per player. (All players must be registered with VVA - $55 per annum). Registration and VVA membership required. Max 4 players by appointment only. Registration and VVA $55 annual membership required. Juniors may participate in the Intermediate session at $10. 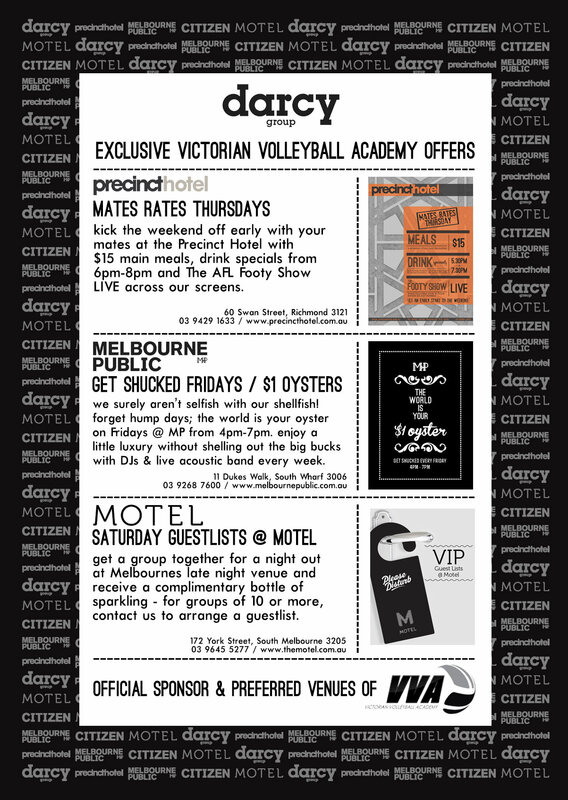 All Volleyball people will be welcomed to these establishments for social gatherings, birthdays, functions or whatever your needs require; the Darcy Group will ensure you will be satisfied. Go to www.victorianvolleyballacademy.com.au and click on “Sponsor Deals” page to see current offers and also contact the Darcy group direct for any function specials for you or your club. The senior teams of the VVA’s Men and Women AVL outfits have been invited back to New Caledonia to compete in a 4 test series in June this year. The last time we took a Victorian outfit to New Caledonia it was an impressive trip with our team coming away with a 2-2 drawn series against a quality National team. The AVL selection on March 18 and 20 will be the selection for the AVL teams and also touring New Caledonia trip. See you at trials. It is with great pleasure that I introduce the “Victorian Volleyball Academy” (VVA). The Academy will provide aspiring and elite Indoor/Beach volleyball athletes a state of the art; training facility combined with the best coaching, directors, trainers, Sports Psychologist, Sports Nutritionist, Sports Chiropractor, strength and conditioning coaches to achieve the targeted results required for each athlete. VVA will be based at the new Maribrynong Sports Facility with access to 4 full size indoor courts, 3 outdoor Beach courts, a full size FIVB court, Strength and Conditioning Centre, rehab facility and Hi Tech equipment for video analysts. Mahamoud (Bubs) Fahour, creator of VVA, explains: “my time at Volleyball Victoria provided me the opportunity to meet really exceptional volleyball people who had a vision and passion that was for the wider volleyball community and elite athletes who never were provided real volleyball development and National/International opportunities”. I am very fortunate to have been able to team up with Victoria University and Maribrynong Sports Academy that allows me to present to you “Victorian Volleyball Academy”. The support provided by these two organisations has been overwhelming and it’s great to have them share this vision with me. Other than myself I am pleased to also introduce two important people who will play a big role in VVA; George Santamaria (Indoor Program Director) and Haydn Ellis (Beach Program Director) who I consider the two best people in this form of the game in Australia driving our vision and program. George Santamaria as program director will continue to drive the success of VVA’s senior teams in the National League but is also excited to develop some of the best young talent we have in Victoria. Utilising current athletes from our AVL program who are also national representatives give VVA the head start in ensuring quality development to those that join the VVA program. Having some of the best Indoor Men and Women player in our academy allows me the opportunity to show case to our young developing athletes how to be the best. We have never had under one roof an academy that will house the best Victorian senior athletes and developing junior athletes training and playing in events internationally. VVA will not only conduct international events for the athletes but also training camps on international soil, this will be an amazing opportunity for anyone that joins our program. Haydn Ellis as program director is excited to have secured two of Australia’s most successful men’s teams amongst its elite program coaches. Owen Boland, Damien Schumann, Cedric Legrand and Josh Court are both training and coaching out of VVA’s Maribyrnong facility. We are also in the process of recruiting the best female teams in Australia. Haydn coaches both teams alongside Al Lyne and expert advice from Shane Ralston. VVA’s program will showcase the training methods and principles used by both VVA’s elite teams. VVA’s beach program will include a pathway that allows players an intermediate level to develop their game to World Tour standard. VVA – Beach will also accommodate players that have never played indoor volleyball. The strength of this program lies in its ability to convert players from indoor to sand as well as train players unique to beach volleyball.